1. Denim on Denim: A denim jeans with a shirt used to be one of the most popular street styles. But things have changed and denim on denim is the latest craze. Just go outside and you will see plenty of people doubling up on their denim. 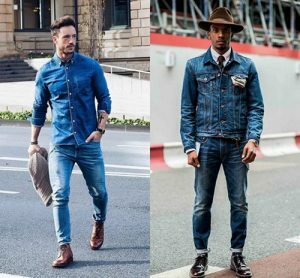 From working professionals to bloggers to celebrities, everyone is following the denim on denim trend. And denim on denim doesn’t mean blue shirts with blue jeans. People are experimenting with the colors. White colored jeans along with a blue denim jacket look very attractive. Many people are also going old school. Dark blue shirts with light washed overalls is also a popular trend. A denim accessory like a denim cap also looks great with the double denim outfit. 2. 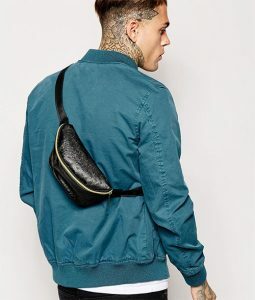 Bum Bags: Bum bags used to be extremely popular in the 80’s and 90’s and they are making a comeback once again. The problem with modern day jeans is that they are trendy but they don’t have enough storage space to keep all your things like keys, mobile, and wallet. Hence, this is the perfect time for bumbags to return once again. They are no longer associated with the elderly people. You will find plenty of young people carrying bum bags. Apart from being extremely convenient, they can also improve your overall look. They are available in a wide range of prints and designs. Black bum bags look really classy but they are also available in a wide variety of colors. You can pick a color which goes best with your clothes. 3. 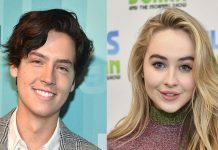 Hawaiian Prints: If you watch a Hollywood comedy movie, you will definitely be able to spot at least one person wearing a Hawaiian shirt. Many people also wear them while holidaying on the beach. But this time they are making a return to the streets in the fashion week. They are very colorful and look really refreshing. They look great with jeans and the best thing about them is that they are extremely comfortable. Floral prints were first spotted during the Dries Van Notens SS18 Collection and since then they have become one of the most popular street trends in Europe. And contrary to the popular belief, they are not just restricted to informal occasions. Plenty of people are pairing Hawaiian shirts along with classic suits. 4. 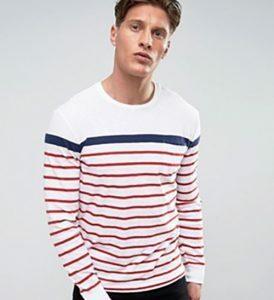 Striped Shirts: From the streets of Tel Aviv to the streets of Milan, you will find plenty of people wearing striped shirts. During the European SS18 Fashion week, they emerged as one of the most popular trends. 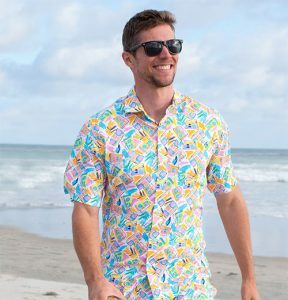 Just like the Hawaiian shirts, they are extremely comfortable and looks like something you will usually wear in your bedroom. The casual look is what makes them so special. These shirts look great along with a beige pant. You can complete the look by wearing a leather sneaker. Sill Mens Review Weekly is your number #1 source of mens news, style, health, fashion and dating advice.